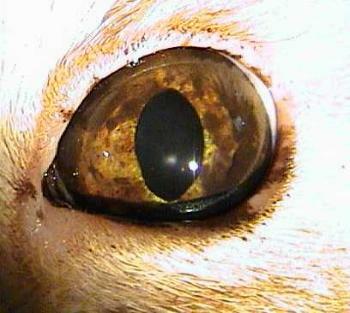 What is the lesion in this ten year old cat’s eye and what prognosis would you give for the eye and the animal? 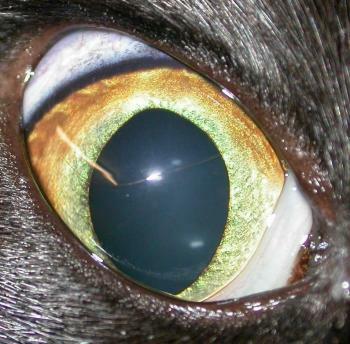 The differential diagnosis of such pigmented lesions in the cat iris is between a benign naevus and a malignant iris melanoma. The velvety appearance of the surface of the pigmented area suggests that latter rather than a more benign iris freckle. Notice how you can see iris detail in this cat with a benign naevus This finding is not good news for the cat with the tumour, especially given the extension of the lesion to the edge of the iris. Glaucoma may supervene as the tumour occupies the iridocorneal angle, and research has shown that once a malignant melanoma in the cat has reached the periphery of the iris, death from metastatic disease is likely to occur (Kalishman et al: A matched observational study of survival in cats with enucleation due to diffuse iris melanoma. Vet Ophthalmol. 1998;1:25-29) while survival after enucleation in a cat where the tumour is less extensive is the same as an unaffected cat.. This entry was posted in Cases and tagged cat, Iris melanoma. Bookmark the permalink.